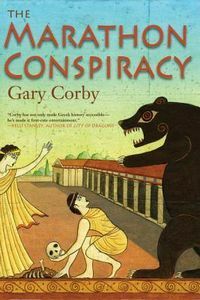 The Marathon Conspiracy by Gary Corby: Synopsis and Online Purchase Options. Synopsis (from the publisher): Nicolaos, Classical Athens's favorite sleuth, and his partner in investigation, the clever ex-priestess Diotima, have taken time out of their assignments to come home to get married. But if Nico was hoping they'd be able to get hitched without a hitch, he was overly optimistic. When they arrive in Athens, there's a problem waiting for them. The Sanctuary of Artemis is the ancient world's most famous school for girls. When one of the children is killed, apparently by a bear, and another girl disappears in the night, Diotima's childhood teacher asks her former pupil to help them. Diotima is honor-bound to help her old school. Meanwhile a skull discovered in a cave not far from the sanctuary has proven to be the remains of the last tyrant to rule Athens. The Athenians fought the Battle Marathon to keep this man out of power. He was supposed to have died thirty years ago, in faraway Persia. What are his remains doing outside the city walls? Nico's boss, the great Athenian statesman Pericles, wants answers, and he wants Nico to find them. What makes it all so ominous is that the skull was discovered by the two students of the Sanctuary of Artemis who are dead and missing. What does a decades-dead tyrant have to do with two young girls? Where is the missing child? Is a killer bear really lurking beyond the walls of Athens? And who is the mysterious stranger who's trying to kill Nico and Diotima? Can the sleuths solve the interlocked crimes and save a child before their wedding?